This is a painting by Jul. Menzel, ca 1920 of the house where Ernst Lips probably lived when he was living with his grandparents Niemeyer. The inscription above the entrance is not known. The house was bought in 1955 by Wilhelm Franz Frederich Lips. It is a very old house, probably from the 17th century. The ceiling of the first story was not higher than 1.75 meters or around or more than 5 feet 6 inches. The people from centuries before were in general smaller than the people of today. The architecture of this old house is "Diemeisachsisch" farm house style. It is built from lumber frame with straw and mud between the frames. These houses have a large gate on the front side, large enough to let a wagon pass. On the right side is normally the stable for cows, pigs and sometimes horses. On the left side are normally the living rooms. Straw and hay was stored under the roof. In the 17th and 18th century the roofs were made from straw. Later they used brownstone, which was very heavy. Ernst had one brother, Carl Frederich Lips, born 19 December 1826 in Gottsburen.4 His godfather was Carl Blankenberg. Carl Frederich lived only a few months, dying 2 March 1827. Their mother, Catharina Elisabeth soon died on 1 April 1827. Ernst went to live with his grandparents, Johan George Niemeyer and Ann Catherina Engel Niemeyer. With the death of his grandmother in 1835 5 when Ernst was approximately 10 years old, he had to live with his father and stepmother. Johan Christoph Ludwig had married Anna Maria Godicke in 1828 when Ernst was four years old. Johan and Anna had six children together, four living to adulthood. But Anna was very mean to Ernst. He had to steal his food to keep from starving. So when Ernst was 15 years old he decided to run away. 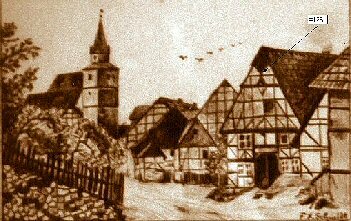 During the years between 1830 and 1880 many people from Gottsburen and surrounding villages were immigrating to America. A few were already there as soldiers during the Independence War between 1776 and 1783. They, after returning to Gottsburen, must have told about the unlimited possibilities in America, which many families had seen as their only way to escape from the very difficult times during the early years of the 19th century. In 1839 he stowed away on a sailing vessel bound for New York.6 He was discovered after three days at sea. The captain said it was too late to take him off the ship. He worked as a cabin boy for fare. At first he got a job selling newspapers on the streets of New York. The other paperboys called him "Dutch Billy" which he hated. He learned to speak the English language in less than six months. He had only one given name, Ernst, which he hated so he decided to add William and changed the spelling of Ernst to Ernest, giving himself the name William Ernest Lips.8 He may have chosen William because it was the English spelling of Wilhelm, the German name given his younger step-brother, Wilhelm Heinrich Lips. It is also possible that Wilhelm was the name of a godfather, as it was not unusual at the time to have several godfathers. It was customary to be named for a godfather. In all known records of him, he is listed as William Ernest, Wm. E. or W.E. Lips or Lipps. He was a self-made man, self-educated and never went to an American school. 1.Lipps, Jurgen E; compiler, Family Records: Lipps Family, Unpublished collectiion of miscellaneous records by Jurgen Lips, Gottsbüren, Germany. Since 1992 the church administration has made copies of the original church records and they are now centralized in Hofgeismar where Mr. H. Rudloph is in charge. These are works of the late Pastor Grundler. 6. Letter to Janice Hartman from Nettie Owen Crundwell: 1883-1971; received 8 July 1970 from Burbank, Ca.